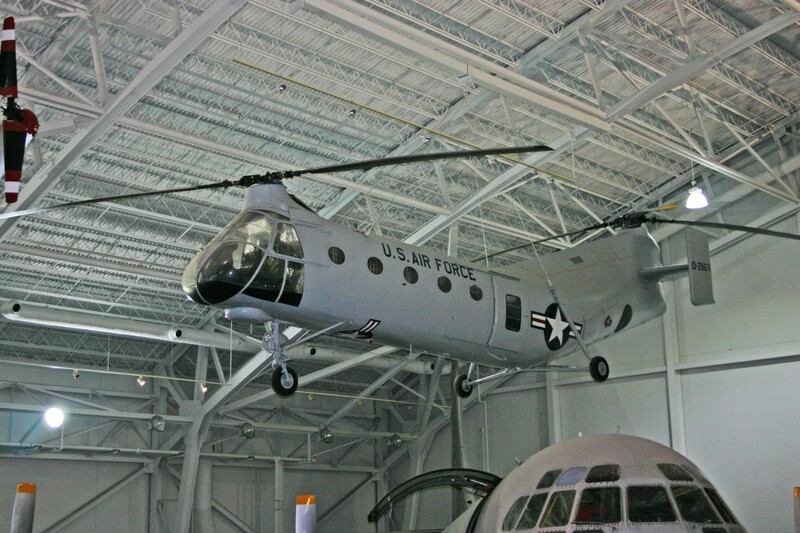 Number Built : The United States Air Force ordered an evaluation and service trials batch of 18 YH-21s from Piasecki Helicopter Corporation in 1949. Following successful trials with these aircraft, 32 H-21As were ordered. Production of the Workhorse continued with the H-21B, ordered for service with Troop Carrier Command as an assault transport, and delivered from 1953. Production of the H-21B for the USAF totalled 163. Total H-21s was 213. Powerplant: One Wright R-1820-103 Cyclone radial, air-cooled engine, 1,425 horsepower. Weight: Empty 9,148 lbs., Loaded 13,500 lbs., Maximum takeoff weight 15,000 lbs. Dimensions: Rotor diameter 44’6″, Length 52’6″, Height 15’5″. Performance: Maximum speed 127 MPH, Cruising speed 101 MPH, Service ceiling 7,750 feet. Significance of Type : The CH-21 arctic rescue helicopter was developed by Piasecki from the world’s first tandem rotor transport helicopter, the XHRP-1. This helicopter was first flown in March 1945. The CH-21 was equipped with an R1820-103 Wright Cyclone piston engine de-rated to 1,150 horsepower. It was first flown in April 1952. The CH-21B was equipped with a 1,425 horsepower engine developing full shaft horsepower. The CH-21 was first delivered to the United States Air Force in 1953 and immediately placed into service in the Arctic without any formal service evaluation. The CH-21 had winterization features permitting operation at temperatures as low as -65 degrees Fahrenheit and could be routinely maintained under severe conditions. It was therefore used by both Canadian and USAF forces in the northern regions of Alaska, Canada, and Greenland in support of Distant Early Warning (DEW) Line installations.